Knowing where your food comes from is important, we all know that. But what about the flatware, plates, pots and pans that you use to cook and serve your delicious, healthy food? At home and in the restaurant industry, folks are taking the next logical step. They’re shopping factory to table for their kitchens and dining rooms. The benefits to your health, the planet, the fair treatment of others and our economy may astound you. We’re concerned about the health and safety of the food we eat, the environmental impact that its production has on Mother Earth, and the fair trade issues surrounding harvesting. Now, people are now focusing on the same issues involving the tabletop and the kitchen. What is in the metal that your forks, spoons, knives pots and pans are made out of? Is there lead or other toxins in the dinnerware and glassware? How many miles did these items travel to reach your kitchen? Under what humane or inhumane conditions were they manufactured? Liberty Tabletop has a solution that’s good for the planet, the economy and you. To address these issues, Liberty Tabletop has now become a one-stop online shop for quality kitchen and tabletop products. What’s more, these products are all made right here in the United States. 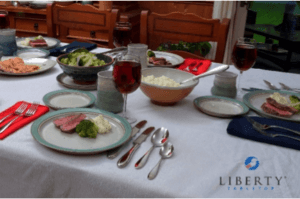 In addition to supplying product to thousands of homes across America, Liberty Tabletop has outfitted several restaurants and hotels with factory-direct flatware and other items for the kitchen and tabletop. Only the finest quality stainless steel is used, and it is also melted and processed in the U.S.A.
“No mystery metal here,” said Greg Owens, co-founder and CEO of Sherrill Manufacturing, Liberty Tabletop’s manufacturing arm. “We require that each shipment of steel is identified by a specific heat/melt number that ties to a test report certifying that the metal is free of contaminants according to U.S. standards,” added Matt Roberts, co-founder and President of the company. In addition to the short travel distance from factory to table, the company also uses hydropower. The company obtains it through the City of Sherrill’s municipal power contract with the Niagara Falls power plant. “The use of hydropower and our avoidance of toxic chemicals in our process easily makes us the world’s most earth-friendly flatware manufacturer,” Owens said. And, Liberty Tabletop cares about the people it employs. “You will find none of that at in our company which is something that we are extremely proud of. It is important to our customers and we know it,” added Roberts. “Our employees are friends, neighbors and in many cases family and we treat them as such,” he said. Liberty Tabletop is more than America’s only flatware manufacturer. It’s now a one-stop shop for almost everything you need for your tabletop. This year we introduced two lines of dinnerware, as well as other tabletop accessories including matching drinkware, salt and pepper grinders, and more. Manufacturers proudly produce all items in the U.S.A. Beyond the tabletop the Liberty online store also features high quality clad cookware with vapor lock technology for healthy cooking. The new product offering extends to the patio with an assortment of “Made in U.S.A.” baskets and soon-to-be-added barbecue tools. 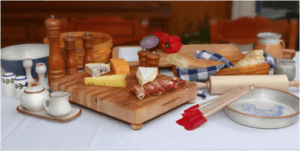 You will also find “Made in America” salt and pepper shakers, as well as a variety of cutting boards, flatware chests and other kitchen items.